I've been working on developing a stick deodorant for the longest time. I actually finished this formula some time ago but have been unable to source a container that could be delivered in less than 10.000 units. For the initial testing purposes, the sample sized container that held (a mere) 15ml was adequate. But initial testing is over. It took months of diligent searching before I had to accept that stick deodorant containers are just not popular amongst European suppliers – at all. Every time I found a supplier that would deliver in the quantity amounts I needed, they were in North America. Just for the record: shipping empty deodorant containers (in any amount) from the USA to Denmark is the dumbest idea in the world. My pocketbook laughed uncontrollably at me every time I even considered it (there were occasions). Never mind - that's all over (for now). I found a supplier in Euroland. These are not only easy to work with, they're a cute as a button. My only wish is that they held twice as much product. So, even though I'm loving the fact that these hold twice as much as the super small test sizes from earlier, the search isn't over – yet. Meantime, I am finally able to invite my regular testers to give this product a whirl. If they're happy, then Essential deodorant Stick will be made available for sale. Hi Danuta - thanks so much for your kind words! 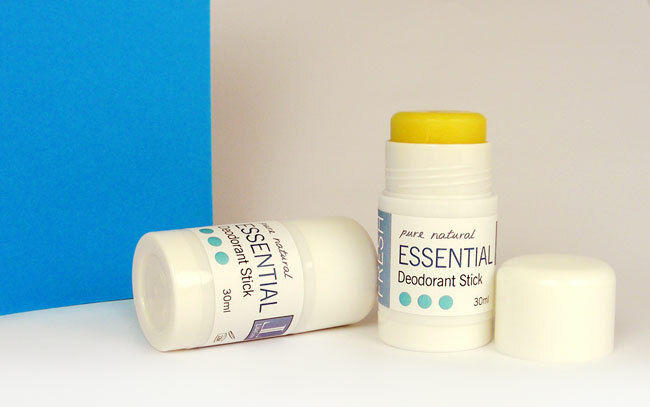 I do have a stick deodorant recipe that I share with my readers (check under the How To page). This particular stick deodorant is being developed for sale, so I'm afraid this is one formula I will not be sharing in detail. I hope you understand. Lisa, Could you share where (which supplier) you bought the deosticks? thanks! Lisa, thanks i will email you in a moment. HI Inger Marie, It sounds to me like you might have gotten an incomplete delivery if the containers were missing the inner caps in the lid. The ones I used (pictured here) were filled by first putting the cap on, then filling from the bottom. There is a 'plug' unit to put into the bottom when you are finished filling. That said, I have been unable to find these exact containers for a while now, so now I'm curious as to where you found yours!